Trulia, founded in 2005, is a mobile and online real estate resource that makes finding a home easy and enjoyable by providing home buyers, renters, and sellers the insights they need to make informed decisions about where to live. 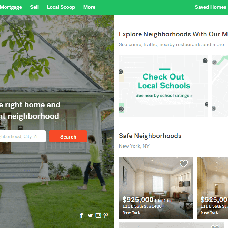 If you want your real estate website to look like Trulia, we offer to make the main landing page of your site to look like that of Trulia. We will also apply a similar colour scheme to the inner site pages. Let us know if you would like to include more changes.